When an artist and blogger that I follow said she was offering an online e-course, I was immediately interested and I signed up to be notified as soon as registration became available. The class, Hello Soul, Hello Mixed Media Mantras, is mixed media art, something I know nothing about but felt an urge to explore. The class is self-paced and broken into three parts: Silencing the Noise, Unleashing your Joy and Trusting your Voice. 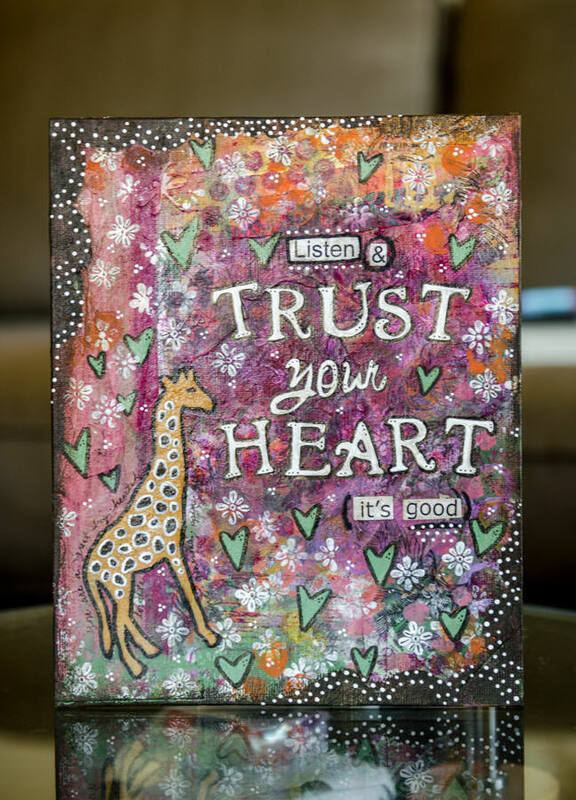 Each section offers distinct instructions ranging from writing exercises that lead you through inner soul work to uncover your own personal mantras to practical techniques in painting and collage. It took me two weeks to finish the course videos and complete my own first painting. And do I love it? Well, yes and no. I think it is too busy and childish looking (not what I was going for). 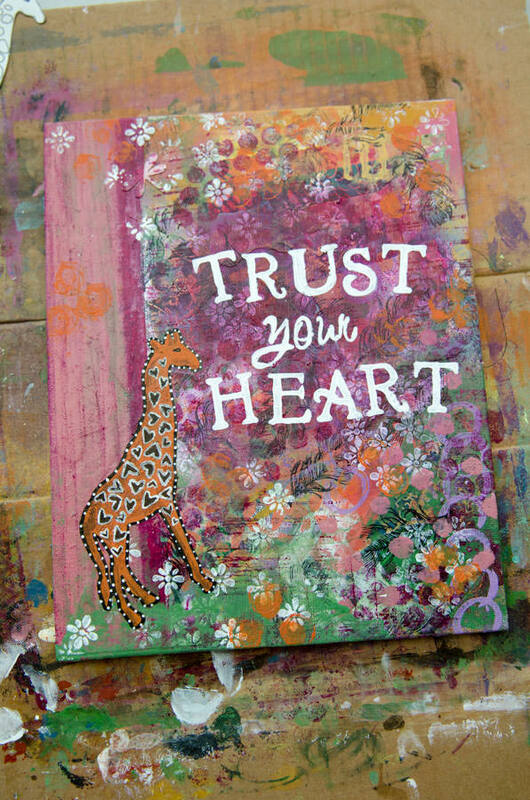 But, I LOVE the message and what this painting represents to me, namely, my courage to try. 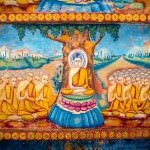 Here is an overview of the process and my takeaway lessons from the course. 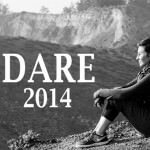 I’m making a mental note to come back and read these lessons again when I get ready to attempt something new as they create an empowering context for the vulnerable adventure of fumbling through uncharted territory. 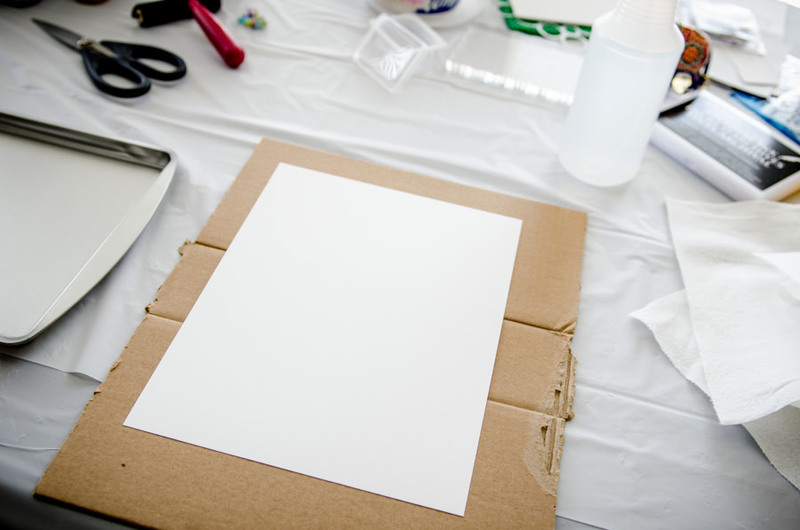 Staring at a blank canvas can be daunting. If it hadn’t have been for the teacher, Kelly Rae, providing us with ample encouragement to just let go and have fun, I would’ve certainly been anxious. 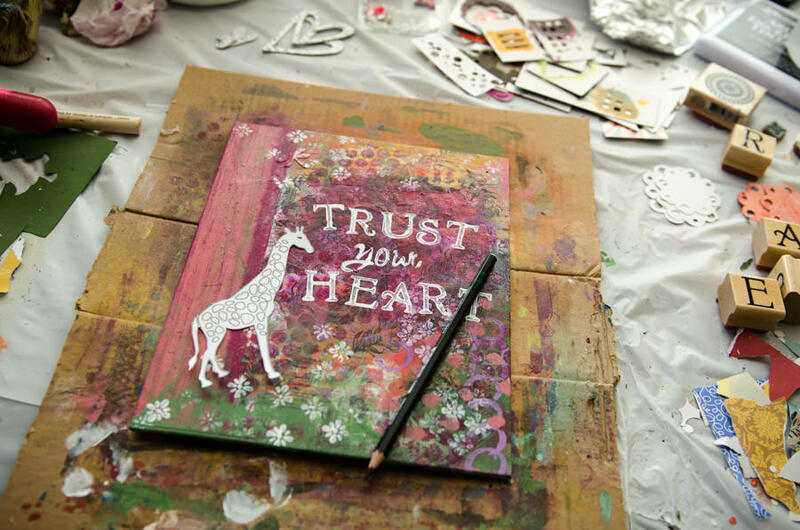 She encouraged us to create an intention for the beginning of every painting session and Lighten Up! was the perfect reminder for me on more than one occasion. Note to Self: It’s not necessary to know where it will end. The most important thing is just to begin. Our first task was to get paint on the canvas by any means necessary. 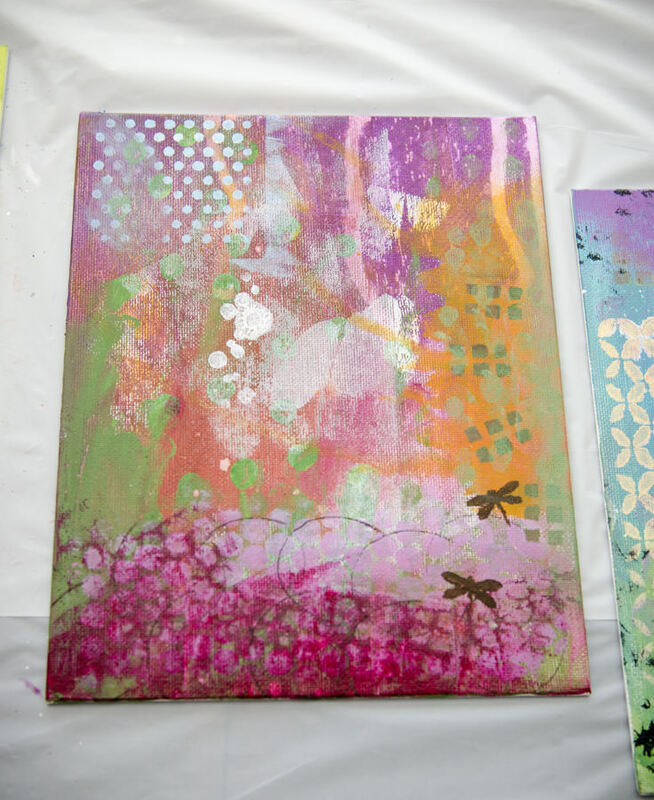 I rolled, I splatted, I stenciled and stamped. I followed the teachers advice and gave myself permission to make an official mess but it was admittedly difficult at first. I used my hands but was still careful not to get anything on my apron. When paint would splatter I had to fight the urge to stop and wipe it up. After a couple of days of dipping my hands into things I finally got down and dirty and that’s when it got ridiculously fun. Note to Self: Let your life be wonderfully messy. 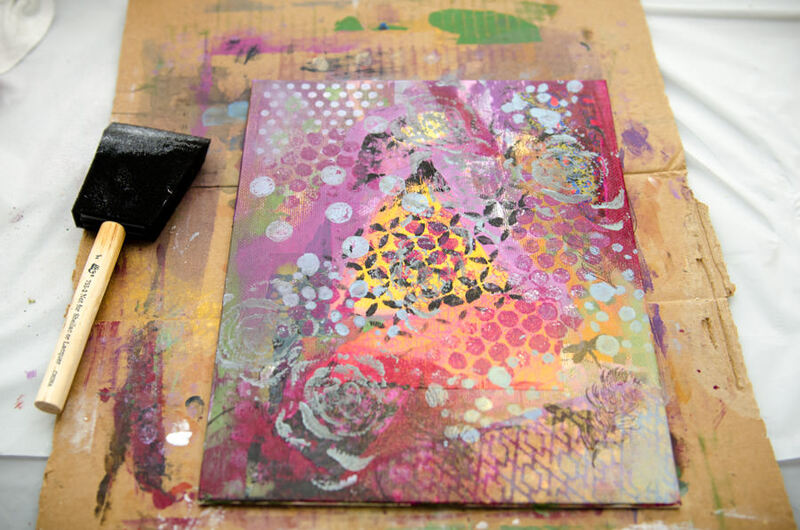 The process requires building layers and layers of paint and texture. It’s a dance between various methods and techniques that are guided solely by urges. The instruction is to go with the flow. In this part, it’s super easy to get lost which makes this a glorious form of meditation or what I began to refer to as art therapy. However, your canvas goes through these weird stages and some are not so pretty. There comes a time when you awaken from your paint smooshing trance and think this is ugly, I obviously have no idea what I’m doing here. Note to Self: A willingness to move through the awkward discomfort of being bad at something is the only way you’ll ever be good at something. After a sufficient number of layers have been built it’s time to bring some order to the chaos. We’re ready to move onto the next stage where we create a horizon, add imagery and our mantras. There are so many options for doing this and you don’t even have to do it. 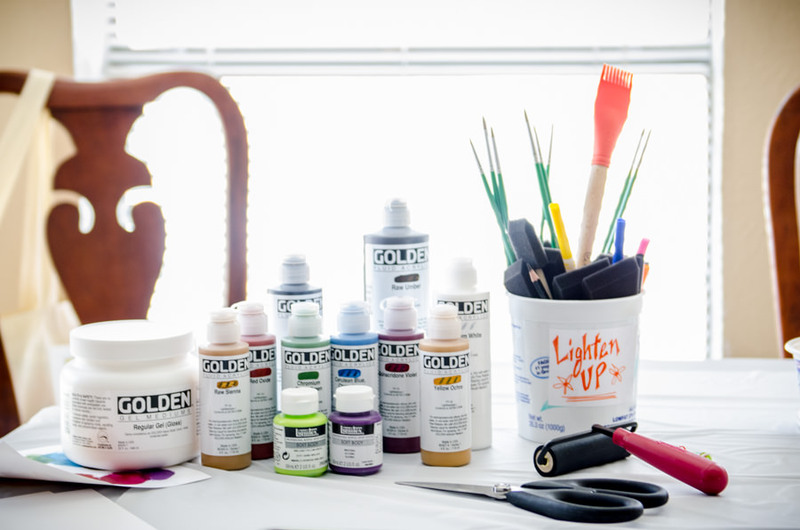 It’s mixed media which means anything goes, you truly have free reign on materials, colors, styles, etc. 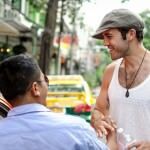 While that is creatively an open door, it can be a bit overwhelming for a newcomer. What should I do? What if I do it wrong? I’m not good at this. And on and on and on. I eventually settled on using a giraffe for imagery because they have the biggest heart of all land animals and they represent generosity in my mind. I didn’t have an actual image to use or a stencil so I printed something off the internet that I could trace and paint in. Note to Self: Trying new things is like putting yourself under a microscope. You will see things about yourself that you’ve never seen before, you will gain new insight into your own ideas and beliefs (whether they are limiting or empowering), you will push up against your own edges and you will grow as long as you JUST KEEP GOING. It’s time to bring it all together into a cohesive looking piece by applying the finishing touches. At this point, I’m not crazy about my giraffe. Let’s just say my painting skills are very elementary so he’s looking more cartoonish than I would like. I tried repainting him once but it wasn’t any better than the first attempt so I’m willing to let him be and chalk it up to the learning curve. It is, after all, my very first try. Here it is in it’s final state. Note to Self: You never arrive so relax and enjoy the ride. It takes many, many hours of practice to gain competency in an area and mastery could take a lifetime. Thinking that someday you’ll be there (wherever there is) is self-inflicted torture and leads to dissatisfaction. There is nowhere you have to get to; this is it. I have since finished two other pieces and am working on several more. I have absolutely loved this process! Since starting the class several weeks ago I’m seeing life through a fascinating new lens and ordinary things occur like textures, patterns and possible color combinations. I’m excited to continue along this path and see where it might lead me, following my whims as my lovely teacher has instructed me to do. 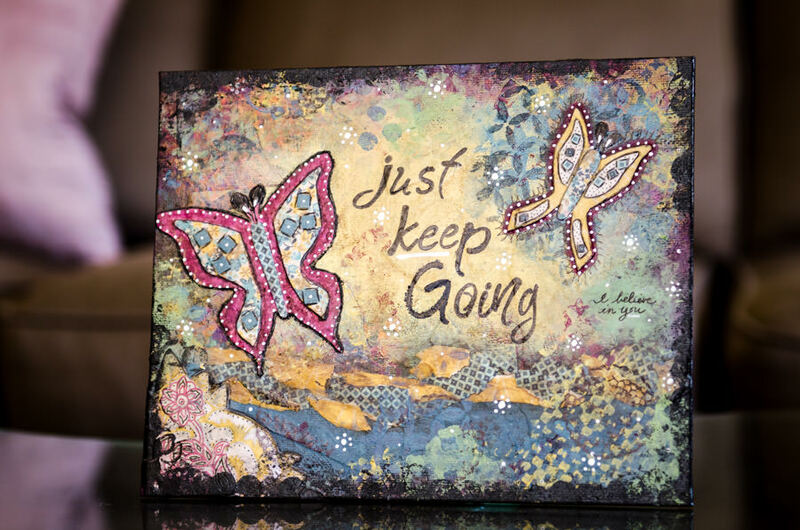 Just keep going. I believe in you. Note to Self: Appreciate those who walk the path before you and reach back to generously show you the way. They are a vital component of your development and growth and a true gift to your life. 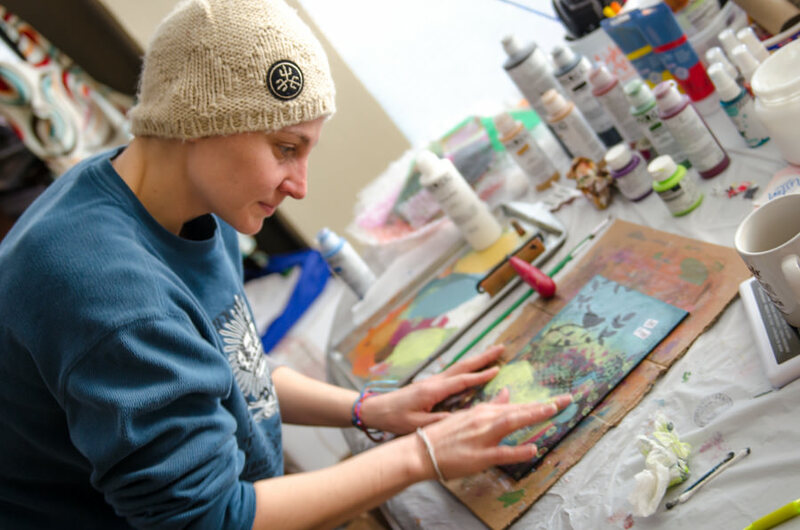 You can find information about Kelly Rae Robert’s mixed media class here. I can’t say enough about the quality of the content and the production of the videos but the true value is in the nurturing space of Kelly Rae. She is relatable, lovable and extremely empowering. 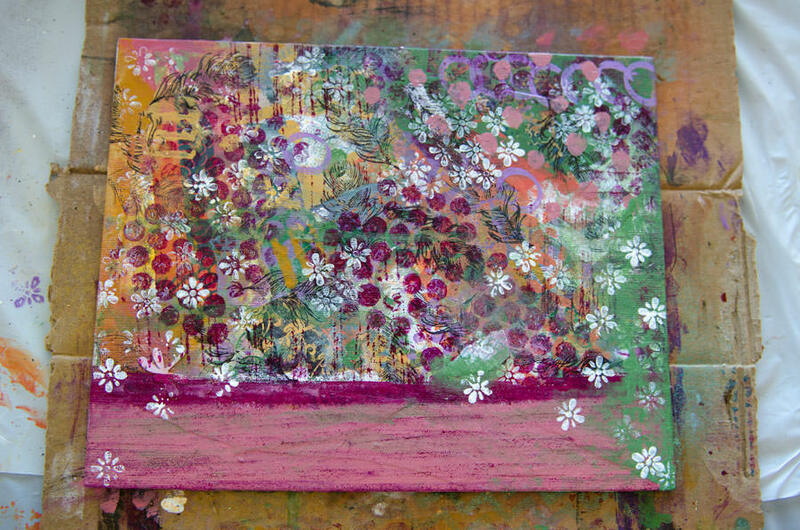 I’d highly recommend this course to anyone who has an urge to explore mixed media. FYI, I am in no way compensated for my endorsement of the course. I just took it and loved it! 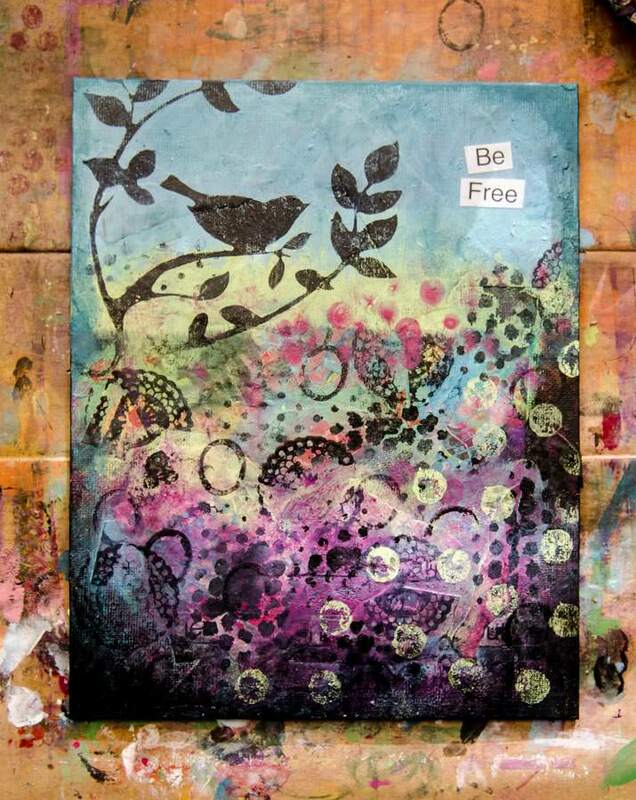 Very impressive, Ashlie, love the freedom and designs you created!!! I just did Painting With A Twist in Grapevine on Saturday night to experience and explore painting with acrylics. My painting turned out pretty good, but it was enough of dipping my toes into that art form for me to know that wasn't for me. I prefer to create murals with my fabrics and make quilts and be it my quirk I can't stand to get paint on me. LOL I truly admire people with creative talent, such as yourself, and others and love to collect beautiful oil paintings to fill my home with color, beauty and love; but I'll leave the creation of those pieces to others. Keep on with your beautiful and inspirational paintings!!! Love ya!! Love this. Thanks for showing it here!! Love them! The colors are gorgeous. The birdie is my favorite, of course. So happy you've found another outlet for your amazing creative talents! Really inspiring and beautiful work. I wanna take the class now. Thank you, Anna. It's proven to be a challenging practice in letting go of expectations but one that is definitely worth the effort. I love your blog, Ashlie. When I first clicked, the photos that popped up made me gasp. Truly beautiful. I cannot wait to read more! That's a pretty sweet thing to say. Thank you :) I'd love to come be your guest!